Or The Evolution of Nigerian Small Chops. And how Indian Samosas and Chinese Spring Rolls became Nigerian Small Chops Essentials. Foodways and food mapping are amongst the things I love about food – all the things that lie on and beyond the plate, somewhat unseen but present, shaping, defining the plate. These fascinate me. Like small chops. Where did that come from? The name but also the specific combinations which the name defines – today, puff puff, mosa, Indian samosas, Chinese spring rolls and meat? Where did India meet Nigeria, and China too? Small chops, by name might have begun as perhaps an invitation to a hangout, a gathering with friends. 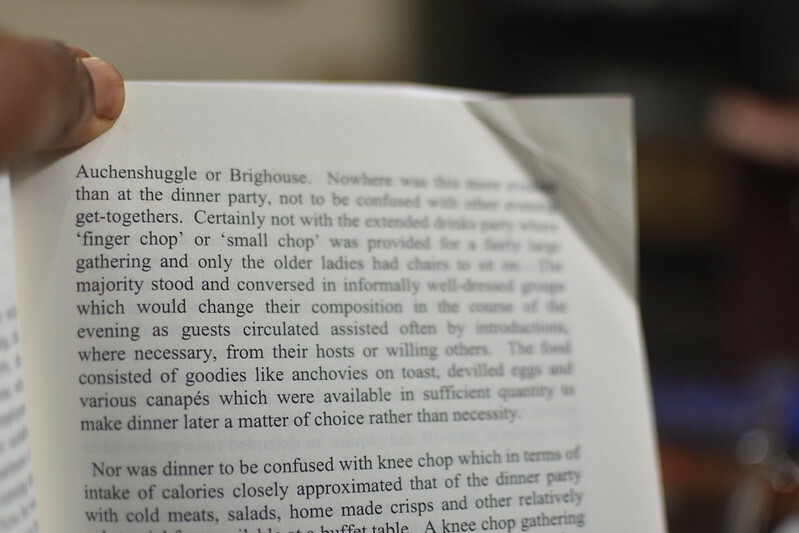 I imagine these words are the birthing lines of this genus, this family of eats Nigerians now call ‘Small chops’. Appetisers, Hors D’Oeuvres and Canapés are all in the same league – small bites often consumed with drinks or prior to the main dinner event. Small chops have existed at least since 1951, and I dare say before, but 1951 is a good place to begin for it was the year in which Ian McCall, a Scotsman arrived to work in Lagos. 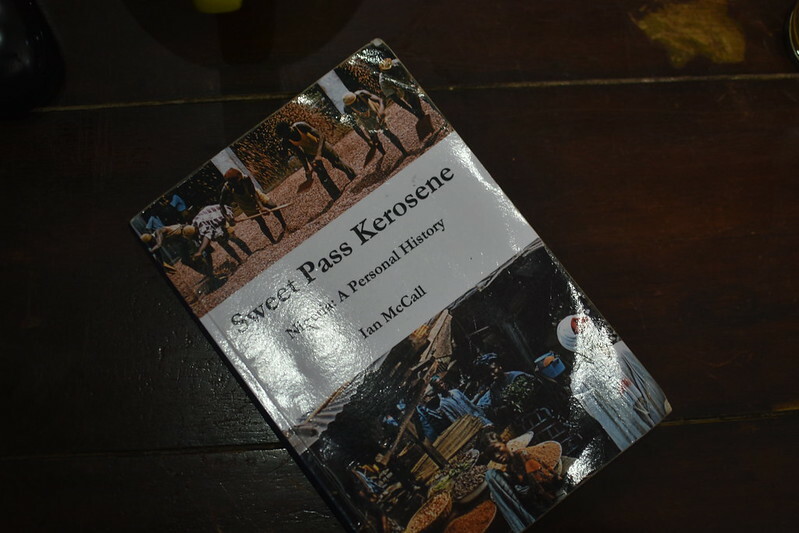 I say this with confidence because he writes about it in his memoirs ‘Sweet Pass Kerosene: Nigeria – A Personal History’. Interesting. And easy to see why. Anchovies on toast? Devilled eggs? Both popular in Britain, before and during the time when they colonised Nigeria. But these aren’t the small chops we know now – they have evolved to puff puff and more. How did that happen? 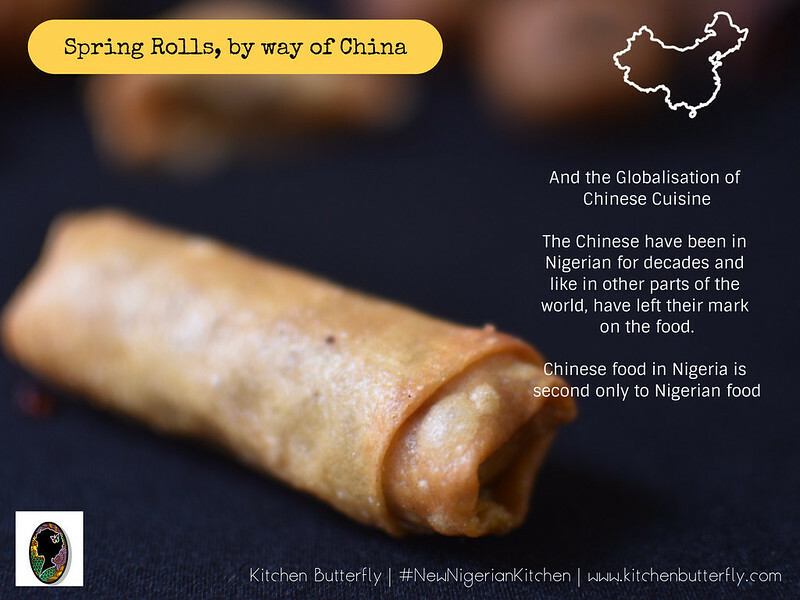 How did they become what they are today – a medley of Nigerian, Indian and Chinese bites. It’s a no-brainer thinking of the Nigerian elements, but how did Indian and Chinese cuisine blend with Nigerian? Indians have been in Nigeria on and off since the late 1800s. The earliest set probably where those brought by the colonial British to construct and manage the railways. The next set were traders and merchants – the Chellerams – since the ’20s, Bhojsons and others. In the late ’50s and early ’60’s, relations improved, with India opening a small diplomatic office in Lagos and then in 1962, Nehru – India’s first Prime Minister – visited Nigeria. This however didn’t materialise into strong, beneficial relationships till much later. India and Nigeria have cooperated in the fields of defence and education for many years. NDA, Nigeria’s National Defence Academy and Naval College, established in 1964 began with Indian trainers – officers from the Indian Army. From 1964 to 1969, Brigadier M.R. Varma, an Indian national was the first Commandant of the NDA [also previously known as the British-run Royal Military Forces Training College (RMFTC) and then after Independence, renamed Nigerian Military Training College (NMTC) before being called the National Defence Academy]. And then came the civil war of the late ’60s which led to Indians leaving the country, returning in the early ’70s in various capacities. So how did samosas come to feature in small chops? 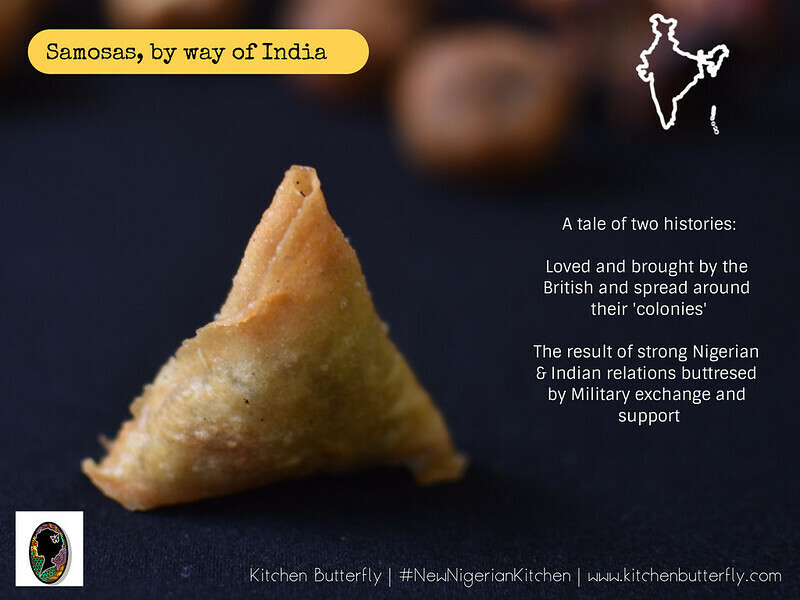 The Indian and Nigerian armies were very friendly and it is likely that cultural exchanges occurred which introduced samosas into the cocktail and dinner party sphere. (Former) Presidents Buhari, Babangida and Obasanjo and a number of Nigeria’s top military personnel received training in India’s defence establishments. So…the Indian imprint and I dare say cuisine was familiar in some circles in Nigeria. I can imagine that with supermarkets and stores, they stocked Indian produce and snacks. With time, this expanded to the non-Indian masses causing it to become a staple ‘eat’. Across Africa, the ’70s were tumultuous for many expatriates. In Nigeria, the end of the civil war, military rule and the rise of economic nationalism reduced the footprint and opportunities for British-led organisations and corporations. British presence was withdrawn across industries, and a lot of British and western expatriates returned to their home countries. The Indians, Lebanese and others who’d come here as merchants and traders stayed. They filled the gap that austerity measures, reduced imports and more created. Indians and Asians from Uganda are “one of the most successful groups of immigrants anywhere in the history of the world”. This strand of migration – from India to Africa to Britain – is unique in the history of Indian diaspora. Indians first moved to East Africa in the 1890s to work in large railway and infrastructure projects. By the 1970s, they were leading in business and other fields — enough to worry dictator Idi Amin, who gave them 90 days to leave Uganda, with only $50 each. As things settled, the Nigerian government and several private firms began to hire Indian doctors, teachers, engineers and other professionals. I’m reminded of growing up in the 80s with a lot of Indian friends and trying various Indian delicacies at theirs. Towards the end of the 1980s, many of the Indian experts returned to India when, with the substantial reduction in the country’s oil revenues, the country began to face severe economic problems. In spite of this, over two hundred thousand Indian expatriates live in Nigeria. And samosas remain, available in supermarket deep freezers and a popular addition to small chops packs. Like spring rolls too. When the British left in the late ’70s, the Chinese ended up providing huge catering resources, supplying homes and hotels and perhaps this marked the introduction of Chinese cuisine to Nigeria. There have been Chinese in Nigeria since the ’30s. By the 1960s, a mix of nationalities lived in Nigeria – Greeks, Cypriots, Lebanese, Chinese, Japanese, Iranians, Indians, Turks and more including the English and French. Some came on diplomatic missions, others – notably the Chinese of Hong Kong and the Greek-Cypriots of Mandilas and Leventis – on entrepreneurial journeys. One of the most prominent, Hu Jieguo – owner of the Golden Gate Chinese restaurant moved to Nigeria in the late ’70s to live with his father who’d moved here in the ’50s and ran a textile business. Though Hu worked with his father, he always had an interest in food and hospitality. Prior to his move to Nigeria, he was an English teacher at the Shanghai Nanhai middle school during the Chinese Cultural Revolution. This knowledge of English was to serve him well during his move to Lagos. He secured a role in one of the high-end hotels and ended up learning about hotel management from its Western managers. He then went on to Canada for a degree in hotel management at the University of British Columbia. At the same time, the Nigerian oil boom created opportunities for major development projects as it had began to pull in foreign investment. The Chinese government at the time had a ‘going out’ strategy underpinned by a desire to internationalise their operations. With the growth in the Nigerian economy, Hu observed that there ‘a supply shortage of decent local hotels had become an issue for multinationals in Nigeria at that time,’. In 1983, his first related business, a restaurant, opened in Lagos. He says his place was called Shangri-la, located on the top floor of the largest and best hotel of the city, and occupied more than 700 square meters. In 1995, he invested $8 million to develop the six-story 4,000-square-meter Golden Gate Hotel in Lagos which opened in 1997 and remains a popular destination for Chinese food in Lagos. It was a golden time for oil and gas exploration in the country and people from outside were queuing to join the industry. There was a severe shortage of hotel space. Hu’s father bought a sightseeing cruise with accommodations in 1975, which is when the family broke into the industry. Hu says after decades, more than a hundred hotels of different category have been set up in the country’s economic hub, Lagos, and capital, Abuja. He has four hotels in Nigeria and Liberia, and another is being constructed in Ghana. Isn’t it easy to see thus how spring rolls – and tiger prawns if I might add – have become embedded in our culinary arsenal? Hu and his family brought Chinese food to Nigeria at the time when China was broadcasting its cuisine to the world. A consistent, targeted globalisation of Chinese cuisine. The Chinese also have a thriving ‘small chops culture’ by way of ‘dim sum’, meaning to ‘to touch your heart’. Dim sum consist of a medley of steamed and fried small bites from spring rolls to dumplings and more. I remember growing up with Jade Garden restaurant in Warri where I had the best dish ever of beef in green peppers. Chinese cuisine was the first cuisine I was introduced to beyond the Nigerian, and it remains a very popular choice with Nigerians. Nigerian restaurants will have a ‘Chinese special’ as a tribute :). So yea, interesting to see how relations with countries – economic, political and other ties have such strength, such power to define and shape cuisines. Food is powerful. I hope with these few points of mine, I have been able to trace possible histories and make small sense of why our small chops are as they are…today.